We got another podcast on the podcast today, so meta... Nick Plesha and Ryan Wisniewski came over to the closet studio to chat! We talked about the Fun Base Alpha podcast, how it started, how it's evolved, and the possible future for it. 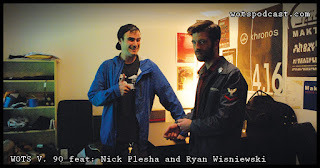 We also got some back story on Nick and Ryan and also learned what Twitch live streaming is all about, what Nick's "Nick in the World" podcast is and so much more. I hope you enjoy this conversation as much as I did.